There's plenty of life left in my Oliver Peoples Tom Ripley glasses and William Morris Harry Palmer glasses. Bought to last — they're lasting. When I finally leave a pair on my armchair and sit on them or Cordings decides they'd make an excellent dog chew, I'll be looking to replace with a Le Corbusier style of frame next. 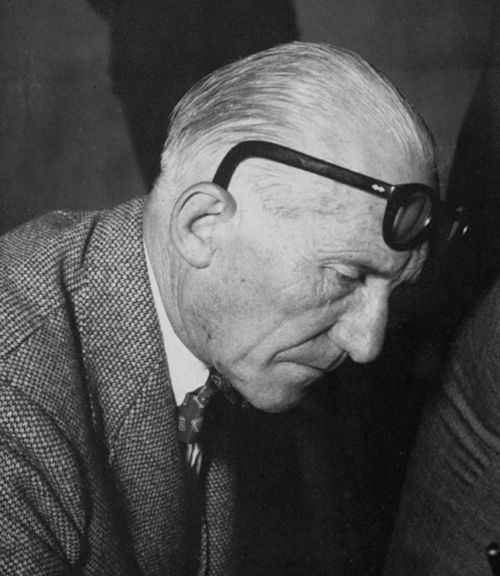 I'm more of a Mies van der Rohe man when it comes to modernist architecture, for his detail and use of materials — Villa Tugendhat being a fave — but Le Corbusier was matchless in terms of eyewear. Many men go for teeny glasses frames in barely there titanium or some such material. It's as if they're ashamed of looking bookish, so they try and mitigate this by introducing a bit of sporty high-tech. Often it's a case of the bigger the swot the sportier the glasses. If you're going to wear glasses, wear glasses. And look bookish. That's the best thing about specs. Le Corbusier certainly wasn't timid about his ocular adornments. His glasses made him look like he spent his entire waking hours bent over an architect's desk. I'm sure that helped with a contract or two. 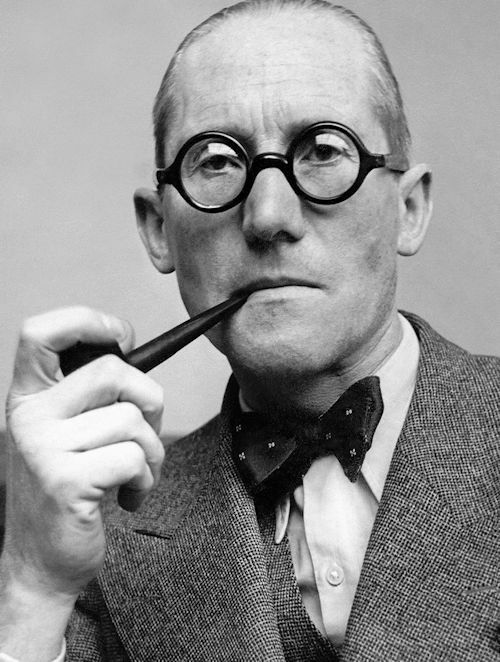 What are the ingredients for his style of glasses? 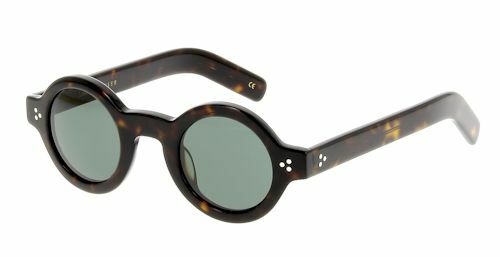 The frames need to be made from a thick black acetate or horn. The frame for the lens must be almost round and quite large, with a thick bridge to connect them. The arms must be straight and uniform in thickness with a significant hook for the ears at the end. The Sleeper frame from Massada of Switzerland is pretty close to the mark. They are made from a hefty chunk of acetate from Mazzucchelli (1849) of Italy. Mazzucchelli is our kind of business. Formed in 1849 and based in Castiglione Olona, Varese, this sixth-generation family business is a world-leader in the production of acetate and polymer materials, particularly for eyewear. The company began by making combs and buttons in horn, bone and tortoiseshell. Masada is based in Switzerland, but the frames are made in Japan and Italy. Massada say there is no wrong style for a shape of face. The point being you just need the swagger of Le Corbusier. This is partially true. The Sleeper is available in a choice of colours, but I think you'd like the traditional black we see above. The Tabu from Lesca Lunetier (1964) of France is also a fine contender for that coveted position on the bridge of your nose. As you can see from the example below, the style is perfectly adaptable for sunglasses. Lesca Lunetier also have a style called Corbs, named after the man himself, but I actually think Tabu is closer to the mark. Corbs doesn't have those centred juts at the side of the frame where the arms join. Rather, the arms join the frame at the top. 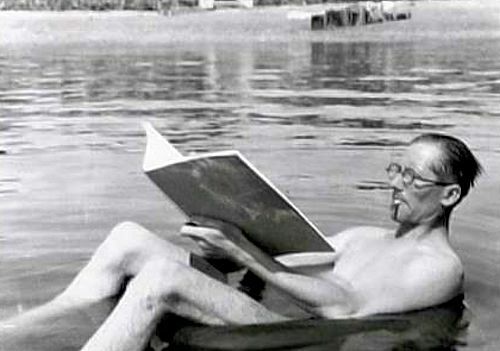 Le Corbusier really should be swapping his glasses for sunglasses when he's reading on the beach. As an aside, how to keep acetate frames shiny? I find that the frames of acetate sunglasses and specs go a trifle dull over time. Does anyone know how to spruce it up? Is there a polish or method that can be applied? "If you're going to wear glasses, wear glasses. And look bookish. That's the best thing about specs." Can't help myself: two eyes good; four eyes better. I'm guessing that the BBC costume department owns a pair of Massada Sleepers which they used recently in Decline & Fall to sculpt the unbeautiful uber modernist architect Professor Otto Silenus. Looking forward to seeing it (and the glasses). Tim Pigott-Smith, Suchet. Promising. Thanks for your eyewear article. I've worn zyl acetate frames for decades and found certain styles retain there character throughout the ages -- such as Anglo American Optical's frame 406. Handmade in London and sold through a variety of channels. I used to find them through Ben Silver until recently (which carry a large variety of classic and traditional frames). Anglo American also has the ability to custom cut new frames to match your existing or out-of-production pair -- even if they didn't produce the original pair. Now that is truly amazing. The quest to prevent blooming on the frame is hard to do over the long haul; however, I try and prevent letting the alcohol based lens cleaner from hitting the frame. If the blooming becomes distasteful to point that you're considering replacing the frames, you may get a little more mileage with an application of baby oil or avocado oil. Roger Stone often wears glasses like these. Not sure they suit him though. Thanks Laurence. The tortoiseshell and the clear versions suit him better than the black. Might be the contrast with the white hair.